· and the place of energy in this picture. 1. We expect HVAC systems to create a comfortable environment through the control of temperature and humidity. temperature and humidity to be within the “Summer” envelope. 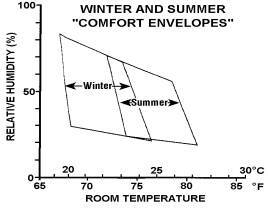 In winter, dressed in winter clothing, people prefer “Winter” envelope conditions. The P.E.I. Occupational Health and Safety (OHS) Act has set certain minimums. In offices, for instance, the temperature must be at least 20°C and the relative humidity at least 30%. 2. We expect HVAC systems to provide air that has acceptable levels of CO2, oxygen, odours, and contaminants. The P.E.I. OHS Act requires either natural ventilation from open windows, or mechanical ventilation that introduces into each room at least 15 cubic feet per minute per person of outside air. To maintain a constant temperature within a building, the heat flowing into the building’s interior space must equal the heat flowing out of it. If heat flows in at a faster rate than it flows out, the space temperature rises; if it flows in at a slower rate, the temperature drops. · · Heat from human bodies. A person, just sitting at a desk, produces 400 Btu per hour. Physically active people produce up to 1450 Btu per hour. · Solar Heat. Sunlight shining through a window is converted to heat when it is absorbed by objects in the room. · Production Processes. Almost all production processes release some heat into the building space. Certain processes — particularly those which heat a product or cook it — can release a great deal of heat. · Heat conduction through the walls, roof, and windows of the building. The rate at which heat flows out via conduction depends on three things: 1. the temperature difference between inside and outside, 2. the thermal resistance — the “R-value” or RSI-value — of the walls, roof, and windows, and 3. the area of the walls, roof, etc. Heat flows out very rapidly when there is a large temperature difference and the building’s structure has a low R-value. · The exchange of air between inside and outside. Here the rate of heat outflow depends on the difference between indoor and outdoor temperature, and the rate at which warm air is being exhausted — the number of litres per second or cubic feet per minute. Whether the air exchange takes place via a ventilation system, production exhaust hoods, or wind-blown infiltration through cracks around doors and windows, equal volumes of air are exchanged. The amount of warm air leaving the building is always matched by an equal amount of cold air coming into it. In the context of heat inflows and outflows, the role of the HVAC system is to balance things up — to provide whatever additional heat inflow or outflow is needed to create and maintain the desired indoor space temperature. On P.E.I., in the winter, this normally means injecting more heat into the space. We start with the energy in a fuel, locked up in chemical form. If our fuel is #2 oil, we’re talking about 36,700 Btu, or 10.7 kWh, or 38.7 megajoules (MJ) of energy in each litre. In the combustion process the fuel combines with oxygen, and the fuel’s chemical energy is transformed into the high-temperature heat energy of hot combustion gases. These gases pass over the boiler’s heat transfer surfaces, and transfer perhaps 80% of their heat energy to the boiler water. The remaining 20% goes up the stack with the gases themselves, and is lost. The next step is to transfer heat energy from the boiler water to the building air, thereby turning that energy into one of the building’s heat inflows. In the simplest heat distribution systems the boiler water is pumped through a network of pipes and radiators around the perimeter of the building. Room-air convection currents pass over the radiator fins, and the heat — moving from water to fins to air — warms the air. Air-distribution HVAC systems distribute both heat and fresh air around the building through a system of ducts. Large electrically-powered fans or blowers move the air through the ductwork. The ducts contain finned coils through which hot boiler water passes, and the ventilation air picks up heat from these coils as it is forced past their fins. Most of the air passing through the ducts is recirculated building air, but a preset percentage is fresh air from outdoors. Part of the job of the in-duct heating coils is to bring this cold air up to room temperature. If the humidity of the air must be raised (as is often the case in winter) this, too, is done in the ductwork. Several techniques are used, but all consume energy. Electrical energy is consumed by the fans, blowers, and water pumps that distribute the heat, with fans and blowers consuming considerably more than pumps. Bringing in fresh air, raising humidity, and maintaining space temperature all have an energy price. For the comfort and productivity of employees this price must be paid; but we needn’t pay more than is necessary. The next issue of $mart Energy User presents an HVAC checklist of practical suggestions for keeping that price down. For more information about HVAC systems and energy, give Ron Estabrooks or Mike Proud a call at 1-800-236-5193 (toll free). Request a copy of the free booklet Energy-Efficient Heating, Ventilating & Air Conditioning.